They have named the winter storm of 2014 as Hercules, and Hercules it is. We got dumped more than 6 inches of snow over night, with strong wind and cold temperature. 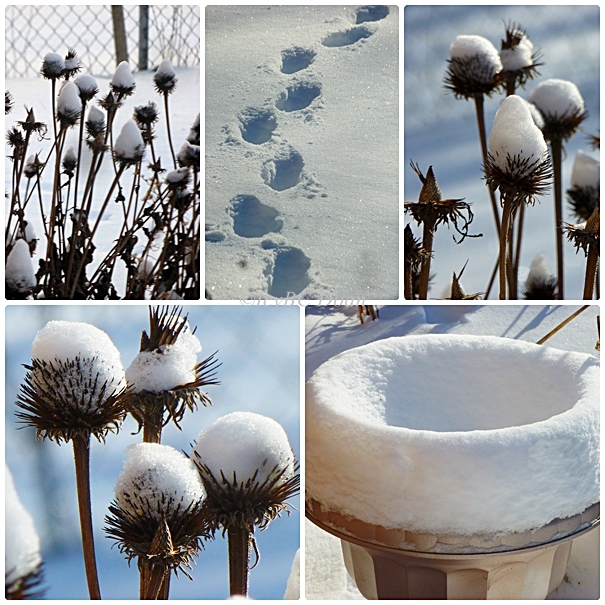 Since I have to go out and clear the snow by the back door, I snap some random photos in the backyard. Hope you all stay warm and safe out there! We got the same here. I like your "snow flowers"! Pretty snow scenes! I like the flowers! Have a happy week! very pretty, but of course, I do understand that behind the prettiness comes a bitter reality of cold. Lovely wintry shots. Stay warm! OMG! So much snow! Those little snow mounds on the flowers are cute. Very cold looking, but very pretty as well! Nice photos. Stay warm! We are more likely to see a UFO than a snow flake here. keep warm and safe, Icy. i know all of us living in the tropics would love snow but in reality, some hate snow. beautiful to look and photograph nonetheless. love your captures!